So Albert, How Do You Bag Lenses? 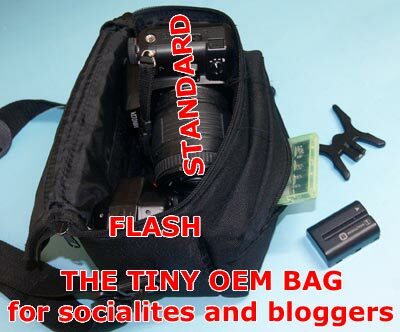 I’ve met a lot of new digital SLR owners who have very few lenses but carry very big bags. 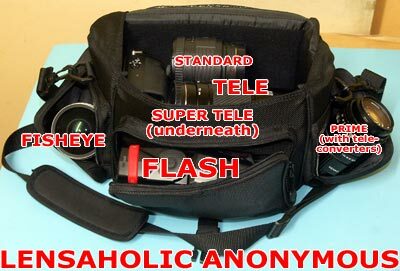 I have a small bag but carry a lot more lenses. So, I’ve written this guide with pictures on how you can use smaller bags to fit more stuff efficiently. SUPERZOOMS, like those newfangled 18-250mm lenses, don’t count here because they are slow focusing, have dark apertures and have some optical compromise… which is why a lot of serious camera enthusiasts do not buy them. 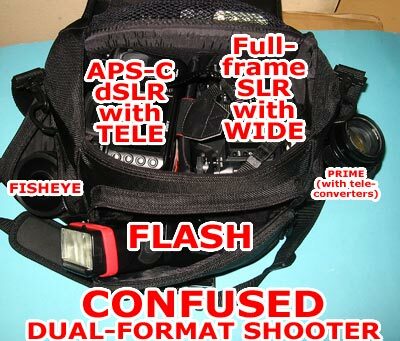 First concept you must learn – the FLASH would usually be L-shaped so it can sit in a smaller bag with an SLR with STANDARD lens. A little pocket fits a camera battery, flash batteries and a flash shoe. What’s it for? You can shoot events with just this setup. Range: Standard range, 18-70mm APS-C perhaps. This same bag can fit a STANDARD, a PRIME and a TELE. This is the most common lineup I see people having… and buying huge Crumpler 7 Million bags for. Damn you all! 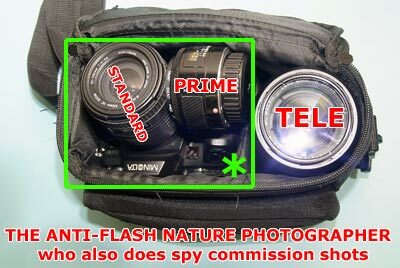 * the green box shows where it should be upside down, that is, the PRIME inside, and back of SLR facing top of bag. 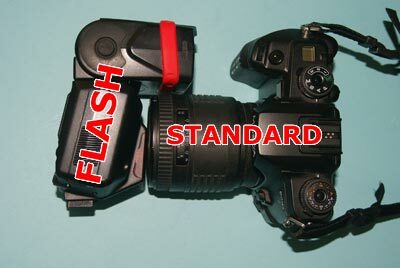 A flash can be added but it must use a flash pouch, clipped to the belt. Howdy pardner! What’s it for? Concerts! A pox on you if you flash the performers. Range: 18-300mm APS-C perhaps with a bright lens in between. The next bag is a Mini camera bag. 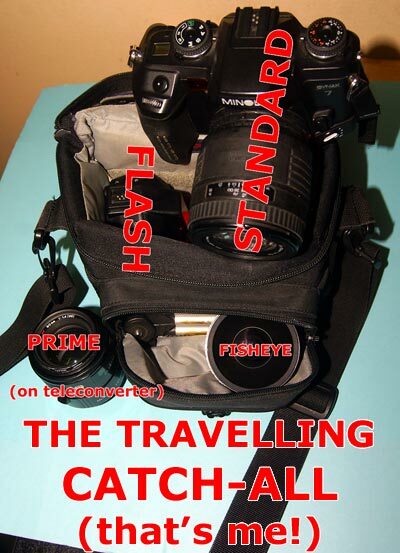 It can house a FISHEYE and PRIME (with teleconverter) in the front compartment. Here it goes from 8mm fisheye to 100mm F2.8 (50mm F1.4 + 2x teleconverter). You can also put the 2x teleconverter on the FISHEYE for a sorta-wide. This is my most common setup. Range: 8mm fisheye to 100mm F2.8 (50mm + 2x teleconverter). 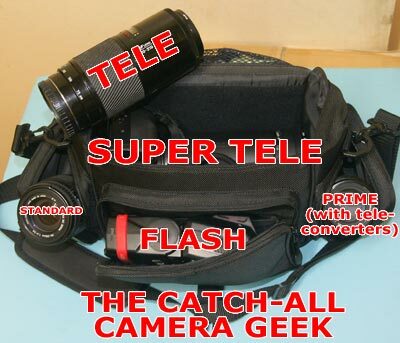 Of course, you could replace the FLASH with a TELE. Range: 8mm fisheye to 300mm. I have a medium-sized bag which is about the size of those Crumplers, I think. 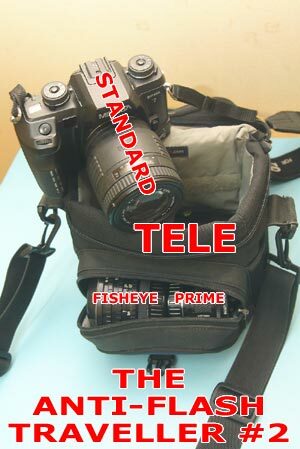 Side pockets are small and can only fit a FISHEYE and PRIME with teleconverters. 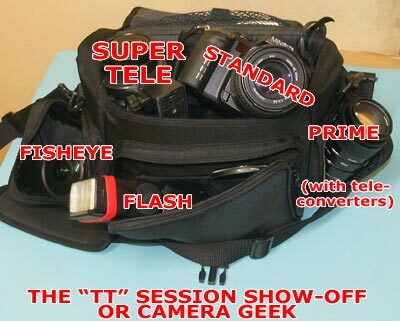 The front pocket is slim and just fits the FLASH while the main compartment has a velcro divider, making space for a SUPER TELE and camera with STANDARD lens. Believe me, I don’t bring the SUPER TELE around as often as I’d like to. Also, the TELE is missing from this lineup. What’s it for? To show off the great deals I got. 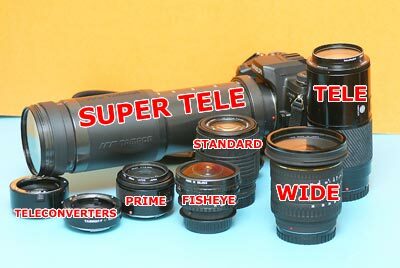 My lenses in total cost less than my digital SLR. Now this is geared to stalkers uh, candid action photographers. The camera already lies in the main compartment, no dividers, with the SUPER TELE on! A TELE can also fit in. Then, I pack in more from the previous design here. It will be a hassle to set up initially, but you’d hang the camera around your neck after that. Some days, when I want to shoot film, I use this setup. The dSLR gets the TELE (since it can get higher ISOs) while the film SLR gets the WIDE. So where’s the tripod? Well, get stabilized lenses or a digital SLR with in-body stabilization. What about backpacks? I like having my bag around my shoulder for quick access to the camera. Anything else would be a specific review – these bags are common form factors. Technical details: Okay, so I cheated and used a Sigma 70-210mm F4-5.6 as a stand-in for a STANDARD lens, since I didn’t have one… and used the WIDE to shoot the photos. Also, your SUPER TELE might end at 500mm instead of 400mm so do the math. This entry was posted in Geek, Jokes, Pictures, Rants on December 18, 2007 by 2konbla. zaque: Yes you can if you try! wombok: Actually, the post is to champion smaller bags. It’s pointless to carry your whole drybox around. Challenge yourself, go out with only 2 lenses! I don’t have a tripod because I rarely ever shoot anything over 1 second (and Sony has Super SteadyShot). I hate carrying even those cheap 1.5 meter tall ones. I am not a tripod junkie and have NO idea, heh. The only time I’d want a tripod is if I was to shoot multiple exposures or infrared. wombok: A tripod is actually more useful than one seems it to be, and allows much creative control as well. Manfrotto is, of course an excellent brand. Shooting scenes that would require long shutter speeds like 30 minutes (on film!) really would require a sturdy tripod. Would take pages and pages to go on how would one use it. did u notice hrm.. HOW BADLY SCRATCHED ur lens are? and even u say.. eh.. how did i get this dent from? FOR YOUR alpha 700.. So many lenses o_O *envy*envy* Didn’t know a small bag and fit in so many lenses. Are those really camera bags? Where to get smaller camera bags? Eee.. I wanna get the Wide and FishEye soon.. Hehehe.. Albert, not heavy ka? bring so many lenses around? and and… are you going to sell your A100 too? KJ: Yeah, I knew of that dint under the mount a long time ago. I don’t know how it was possible. Similarly the crack that came to my flash in 1 week was strange because it was always in my padded Lowepro facing the padded wall. Thanks for posting this. Very timely and useful as i have been looking around for a new bag. Oh and maybe a post on tripods next? The ‘free’ ones from the shops are alright for point and shoots but i feel it ain’t sturdy enough for a dslr. Camera friends have recommended ‘manfrotto’ and the likes but they cost a bomb, so would appreciate your input. XJ: This is your kinda forum thread. I think there is quite a clear division between shoulder mounties and backpackers. LOL.